I just came across this fascinating article, about the process of creating a gravestone memorial, on a public radio station in San Francisco — How do you Capture a Life in Stone? Blending Artistry and Culture to Honor the Dead. 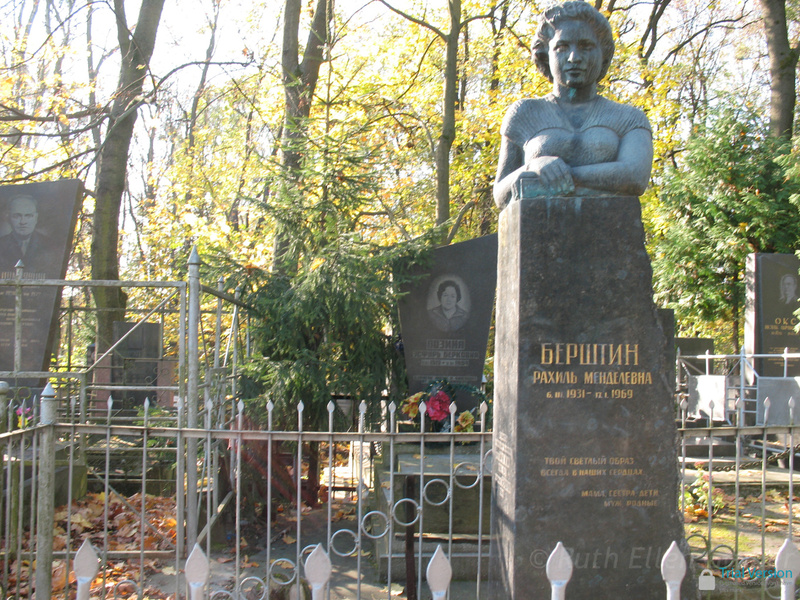 The author, Melanie Young, speaks with gravestone carvers who work today in the area — including one immigrant from the former Soviet Union, who explains the technique used there, which includes detailed etched portraits of the deceased and other sculptural forms. Through his training, Radar mastered the very distinctive Russian style. If you go to the Russian section of the Jewish cemetery, it feels a little like you’ve entered a fairytale. Huge, granite sculptures rise up to represent the dead. They cover the entire grave and reach as high as 16 feet. Some take the form of a loved one’s passion, such as a life-size guitar or grand piano for a musician, or a winding strip of film for a photographer. For many years, Radar also hand-etched images into granite. Much like creating a tattoo, he would use a needle and etch in each dot. He created vivid images. The work was slow and painstaking. But he says he didn’t mind. Today, Leon Radar’s son, Michael, says computers have changed all that. “We have a different technique now. It’s also etched in stone but it’s half computerized half sand blasted,” Michael Radar explains. In a way, the process transforms granite into a photographer’s lens. Families can design much more intricate and realistic imagery for their loved ones. Michael Radar points to an example of the work. The wonderful imagery on East European tombstones was created by talented and extraordinarily creative stone-carvers who are now, for the most part, anonymous. Everyone so often, a photograph of a more recent traditional stone-carver turns up. Sergey Kravstov has sent me the image below. The illustration is from the catalogue: The Jewish Art of Solomon Yudovin (1892-1954). From Folk Art to Socialist Realism, by Ruth Apter-Gabriel (Jerusalem, 1991). Yudevin was a wonderful artist born near Vitebsk, the same town where Marc Chagall was born. 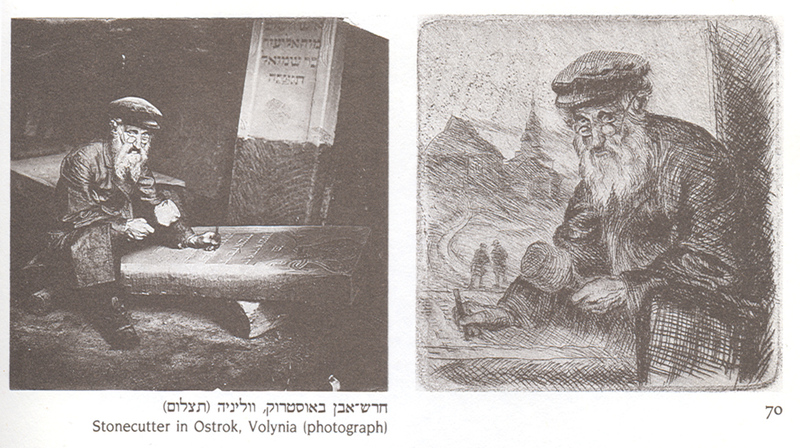 The drypoint at right, dated 1939, is clearly based on the photo at left, taken in Ostroh/Ostrog in Volhynia — probably during the expedition into Ukraine led by the Yiddish writer An-Sky in 1912-14 to document the rapidly disappearing Jewish cultural life of the shtetl. This would mean that it was taken by Yudovin, who was a photographer on that expedition. It’s a very dramatic shot and to me looks staged! I have tried to figure out what the design he is carving is — but I can’t make it out…. 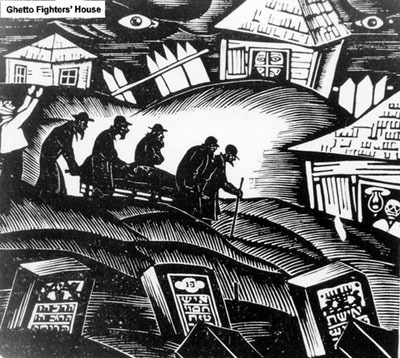 Here below is a wood cut by Yudevin that shows a funeral at a shtetl’s Jewish cemetery — including the gravestone of a woman that bears the typical candlestick motif. 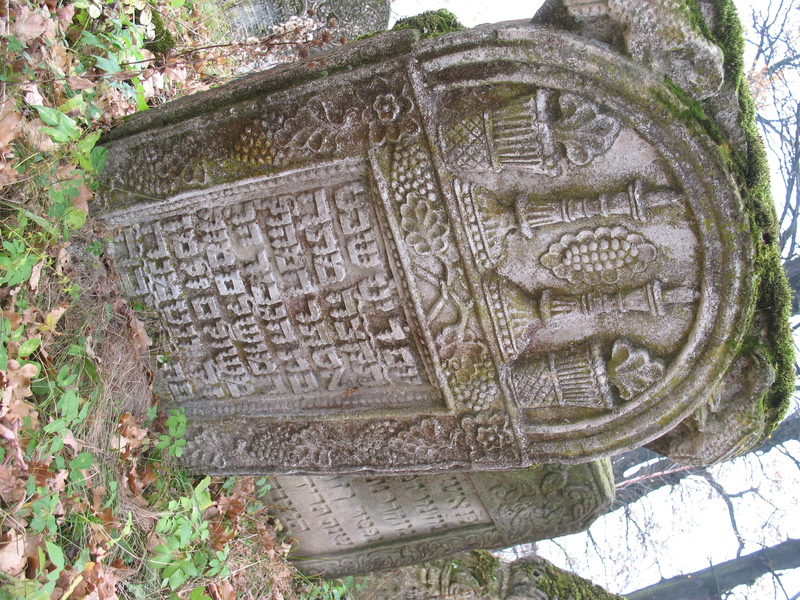 Just an addendum to previous posts… In his detailed analysis of the Old Jewish Cemetery in Siret, Romania (in operation approx 1700-1840), Silviu Sanie notes that “shards and pieces” of “scrapped” tombstones were found during research in the Old Cemetery, proving that there had been a stone-mason’s workshop “in the close vicinity or even inside” the cemetery. He also notes the presence of Jewish families named Pietraru, in Romanian (as well as the Steinmetz and Picker noted by Moshe Barasch) indicated that they may have carried out the stone-mason trade. 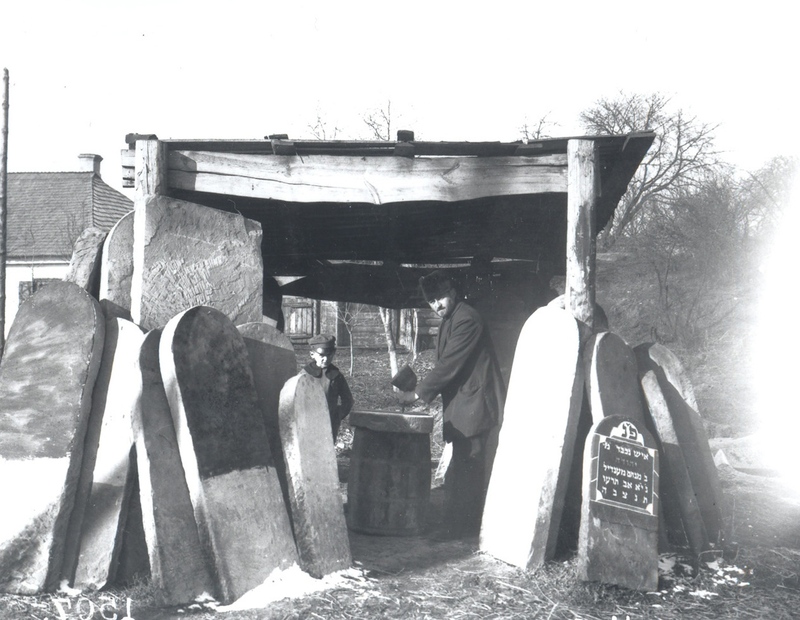 A few days ago, I posted this picture of a tombstone-carver, taken in Ukraine in 1916. The earliest tombstones bearing candlesticks to mark women’s tombs that were found and described by Boris Khaimovich in Ukraine and Silviu Sanie in Romania (Siret, just on the Ukrainian border) date from the late 18th and very early 19th centuries. By the mid-to-late 19th century, the imagery was almost universal. The young carver Goldenberg’s account in Ozarintsy shows how strongly engrained the tradition became.